It is the work which I made for imaginary subversive fashion show that still have not been realized, but who knows maybe will be realized in the future. The name of this show is "Cabin of Uncle Tom." The models I have planed have to be pensioners/elderly people from the former USSR. There is a lack of attention to this people in Russia nowadays. They are feeling desperately lonely and in need of moral support. My relationships with them, communication, artist's research showed also that they still like to be playful, and participation in carnival is not a bad idea for them. Also the Russian tradition has no carnival as a common thing in culture and it's a way to reach out to the European tradition. 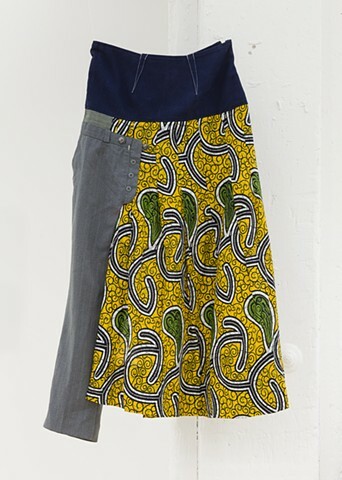 I imagine the participant of the show will wear the kind of clothes which partly consists from African outstanding beautifully textile mixed with the soviet pants. In the end the image of this dress coincide with the gender issue, I am proposing the other view on masculine/feminine topic with the help of this clothes, beside the idea of African-Russian relationship which is present as well.